On Saturday I started blocking all my dish cloths. I could only fit 15 on the board at once, plus if I kept going I would have run out of pins. On Sunday I took the 15 dish cloths off the board and put eight more on. Monday morning the dish cloths were dry so I took them off the board. Several people have asked me how to block so I am going to explain it in my first post. Step 1: Find a medium sized tub or container, and fill it with cold water and a little bit of soap if your dish cloth smells. Step 2: Put a finished dish cloth into the water and soak completly. Step 4: Lay out on a sewing cut-out board (cardboard) and stretch to right size. Put sewing pins (pins with bigger heads work better) in all four corners making sure it's square. Step 6: Repeat Step 5 on all side adding more pins if needed. Make sure you are stretching it as you're going to make sure the sides are even and straight. Step 7: Start a fan, so it is blowing on dish cloth. (This will prevent cardboard from getting to damp.) If wanted, block other dish clothes. Clean up. Leave cardboard with dish cloth out to dry overnight with fan blowing on it. Step 8: (When dry) Pull out pins and fold dish cloth neatly. Blocking dish clothes is very easy, it just takes a while when you have to block 15! 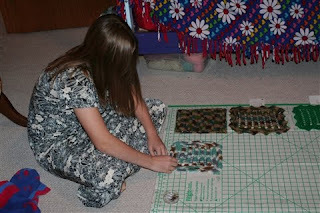 Use this same method for other projects, just add the necessary amount of pins. Sarah, you have a very cool site. I like it alot! Very proud of you honey. Keep it up. I do this with my doilies but have never done it with my dishcloths. 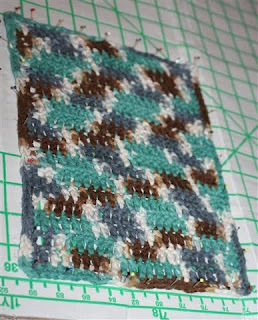 I just block my dish cloths my dish cloths so they look nice when I sell them. They unblock themselves when you use them.